Enter the shortest dimension here. Posters will be rotated to print in the proper orientation. Enter the longest dimension here. Posters will be rotated to print in the proper orientation. For most projects, the 8 mil. Kelly Satin or Glossy Photo papers and 31 lb. or 45 lb. 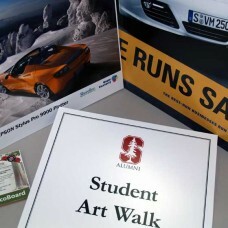 Kelly Presentation Matte papers render excellent, professional looking poster prints. The most economical 31. lb. Kelly Singleweight Presentation Matte renders excellent results but may not be suitable for posters with heavy ink coverage, in which case the Doubleweight Presentation Matte is a better choice. For the absolute best possible quality, choose the Epson Enhanced Presentation Matte or one of the Epson Premium Photo papers. Cost of mounting is based on the square foot measurement of the piece. Unit price shown is rate per square foot. Cost of laminating is based on the square foot measurement of the piece. Unit price shown is rate per square foot. Same day turnaround is available for some products, such as business cards. If available, artwork must be received by 10:00 a.m. for orders to be ready for pick-up at 4:00 p.m. Always call to confirm schedule availability. Standard turnaround time is 2-3 days. We prefer high resolution PDF files but accept other file formats as well. Please see our File Preparation Guidelines page for more information. If you encounter difficulties with the file upload process, please use the File Upload link in the top menu and reference this order number after completing your checkout. If submitting Word or Pages files you may want to see at least a soft copy proof, if page breaks and font matching is critical. NOTE: You may upload multiple files. Top quality large format printouts from our Epson SureColor P10000 printer are available on a variety of materials. 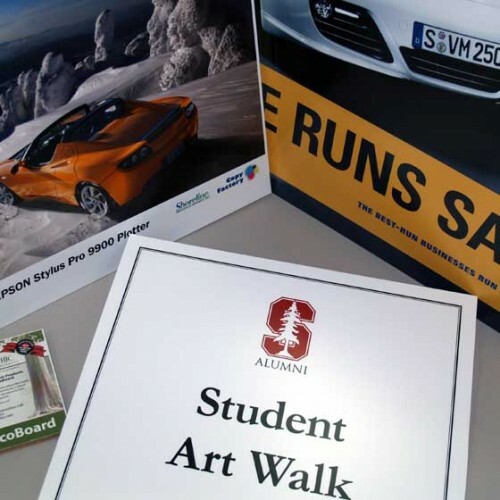 Whether it's an important technical presentation, point-of-purchase poster or an artistic photo, we can output, laminate and/or mount your project affordably and on time. Copy Factory provides digital and offset printing, color and black & white copies, poster printing, and bindery services for Palo Alto, Los Altos, Mountain View, Menlo Park, Redwood City, Sunnyvale, San Jose, Santa Clara, the San Francisco Peninsula, Bay Area, South Bay, California, Nevada and the nation at large. Prices and services subject to change without notice. Copyright 2005-2019 © Finley Communications, Inc.